With out super simple WooCommerce to Intuit QuickBooks plugin you can easily automatically create customers and invoices in Intuit QuickBooks when purchases are made on your WooCommerce online store. When payments are made (or orders are set to completed) payment is also registered against the invoice. You can also sync manually created orders from the backend of WooCommerce to Intuit QuickBooks (which can also be helpful for existing orders before you installed the plugin). The plugin supports taxes and multiple currencies (please note the base currency of WooCommerce must match the base currency in QuickBooks). In the plugin settings, enter your Order ID and Purchase Email to receive automatic updates as they become available. Then connect to your QuickBooks online account with our easy 1 click authentication method! Then select the product type from your QuickBooks account that you want products to be filed under and select a tax rate from QuickBooks if you are charging tax in WooCommerce. You can also select which accounts you want new products associated with. That’s it! There’s no overwhelming amount of plugin settings; it only takes a couple of minutes to setup. There are other great plugin solutions on the market with all sorts of bells and whistles. But our WooCommerce to Intuit QuickBooks plugin concentrates on the core functionality, with a super simple UI and unlike our competitors we don’t force you onto an expensive monthly subscription. With our plugin you can pay once and get updates for a year and save heaps of money in the process, even if you renew each year to get an updated licence! WooCommerce to Intuit QuickBooks plugin is built by the 5 star rated plugin developer house based in Sydney; this means you will receive unparalleled support and can have peace of mind when it comes to code quality and security. If you have any questions about the integration please don’t hesitate to contact us. When products are purchased on your online store, matching product SKU’s in Intuit QuickBooks will have their inventory decremented automatically depending on the amount of products purchased. This feature can be turned on or off from the plugin settings. 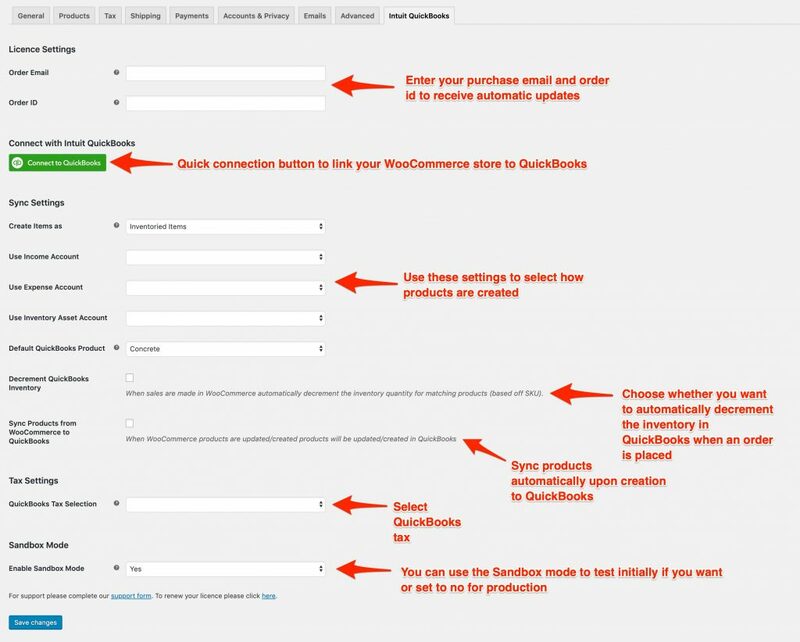 When products are created or updated in WooCommerce you can create and update items in Intuit QuickBooks automatically. You can turn this feature on and off in the plugin settings. At just $90USD with no ongoing subscription cost, the WooCommerce to Intuit QuickBooks plugin provides a simple but powerful method to integrate Intuit QuickBooks with your WooCommerce online store.WooCommerce to Intuit QuickBooks includes free updates for 1 year and the plugin can be renewed for continual updates if necessary. WooCommerce, Intuit QuickBooks and WordPress are separate products and not owned or managed by Northern Beaches Websites. The price of the plugin does not include the price of an Intuit Subscription. To learn more about Intuit QuickBooks please click here. Please read the terms and conditions for WooCommerce to Intuit QuickBooks here.